Look! I got my act together and made us a Thanksgiving recipe! Granted, it’s another side dish, but who doesn’t need another side dish idea the upcoming week for when you realize [insert way that things didn’t go to plan this week, as it never does for anyone every year]. No worries. 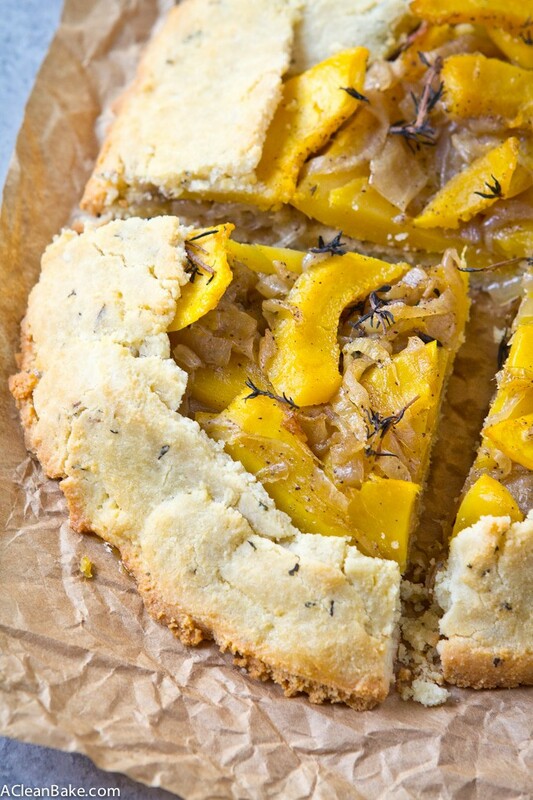 I totally have you covered with this acorn squash galette. It tastes so fancy! But only takes a little while to make! Rustic imperfection is part of its charm! And you get the help of appliances to make it! First, make the caramelized onions. But make them in your slow cooker, so you can go do other things while they’re caramelizing and you don’t have to wait around watching the oven. Also, make them in advance, since you can make a big batch and keep them in the fridge for awhile (up to 2 weeks, in my experience) or in the freezer for even longer (up to 2-3 months in an airtight container). So, that’s done. Next, make the filling by roasting or steaming a small, peeled, seeded and sliced acorn squash (you can use butternut if you prefer; in order to quickly cook it, I peeled, seeded and sliced the squash and then quick-steamed it in a covered pan until soft) and toss it with the caramelized onions and seasonings. Finally, make the crust. 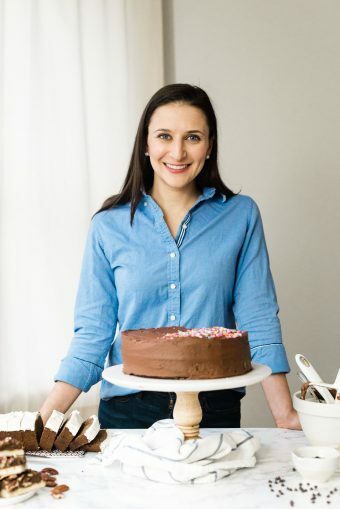 All you have to do – and I mean this completely literally – is throw the ingredients, first dry, then wet, in a food processor and mix until a ball of dough forms. To assemble the galette, gather the dough in a ball, sandwich it between two pieces of wax or parchment paper and roll (or press) into a disc. Pour the filling into the center and fold the edges over to seal it all in (if you have any issues with the dough cracking, just wet your fingers and re-hydrate that part of the dough until you can seal the crack back together). Then brush with egg wash – which is an optional step, but helps with browning – and bake. 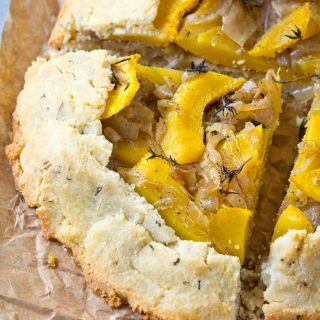 This acorn squash galette with caramelized onions and thyme crust is a crowd pleasing side dish for a dinner party of holiday that is so easy to make! Preheat the oven to 350F. Get out a baking sheet that is large enough to hold a piece of parchment, and set aside. Make the filling: In a large mixing bowl, gently fold together all of the filling ingredients until thoroughly combined. Set aside while you make the crust dough. Make the crust: In the bowl of a food processor fitted with the "s" blade, pulse the almond flour, coconut flour, thyme, salt and pepper together several times to combine. Add the butter (or coconut oil), and pulse several times until the butter pieces (if using) are the size of small peas. While the machine is on, pour in the milk and egg white and continue to process until the dough comes together in a large ball or mass. Scrape down the sides of the food processor bowl to make sure all of the dough is incorporated, and then turn out the dough ball onto a large sheet of parchment paper. Top with another sheet of parchment, and roll into a disc about 1/4" thick. 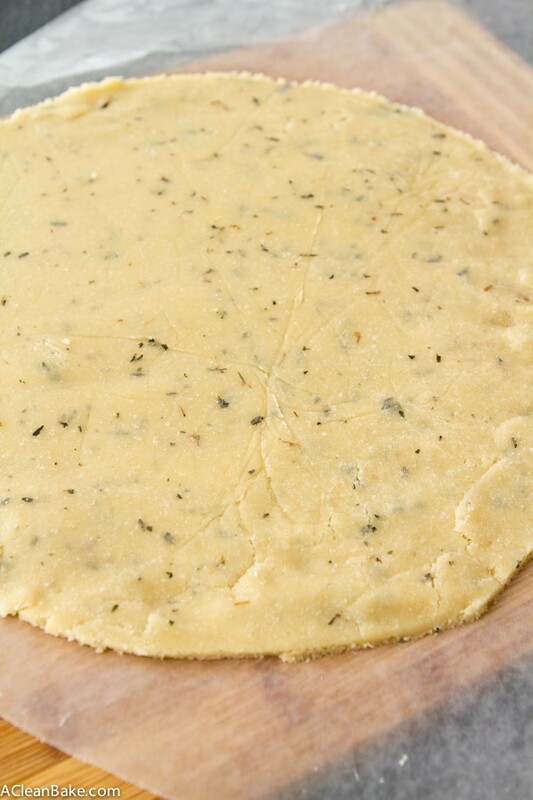 Make sure the disc fits within the width of parchment and the parchment fits on your baking sheet. If you need to make the dough disc a little thicker to make sure it fits, do so. Grasp the parchment firmly on both sides and, applying enough tension to keep the parchment paper as flat as possible, transfer the dough disc (with the parchment) onto the waiting baking sheet. Add the filling to the center of the crust, leaving about 2" empty. 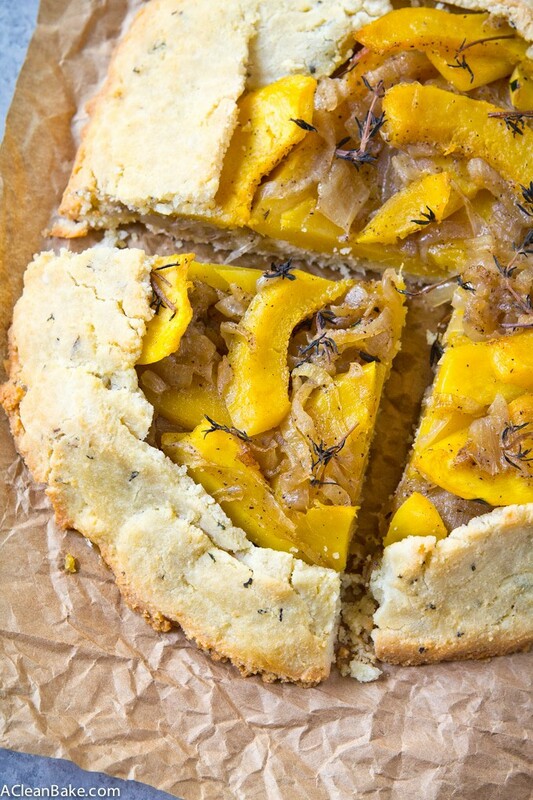 Pick up one corner of the parchment and use it to fold the empty dough over the peaches. Then rotate a few inches and do the same again, folding the crust over the peaches (overlapping the first fold slightly). Continue to repeat this motion until the entire filling has been encased in the extra border of dough. Make the egg wash by whisking together the egg and milk. Brush the top and side of the galette dough (all exposed dough, NOT the filling), with egg wash.
Bake for 30-40 minutes until the crust is firm and golden. Allow to cool on the baking sheet for at least 10 minutes before serving. You can replace the acorn squash with butternut if you prefer. 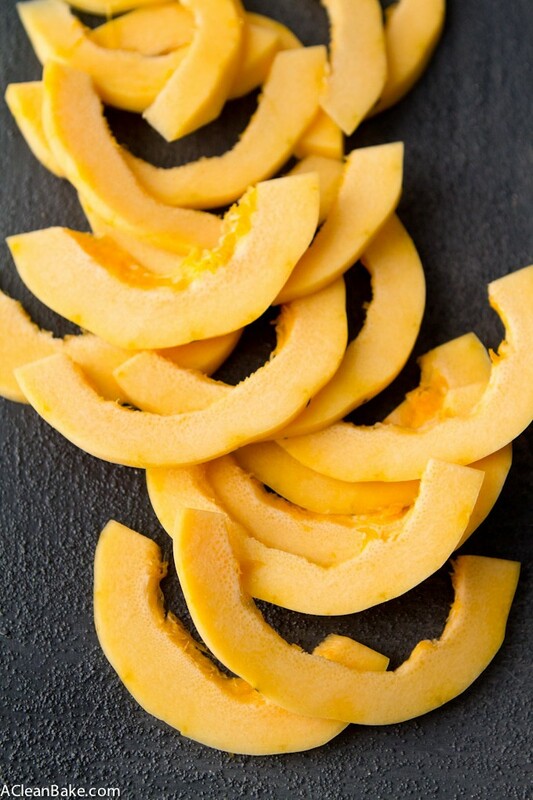 In order to quickly cook the squash, peel, seed and slice it, then put the slices in a pan with about 1/2" of water, cover it, and cook, stirring occasionally, until softened. Tip for folding the dough: Using the parchment to fold helps minimize cracks but if your dough still cracks, just use your fingertips to gently smooth and reseal the crack. If that isn't working well, dip your finger in a small bowl of water before smoothing over the cracks. This will rehydrate the dough and allow it to form a seal again. 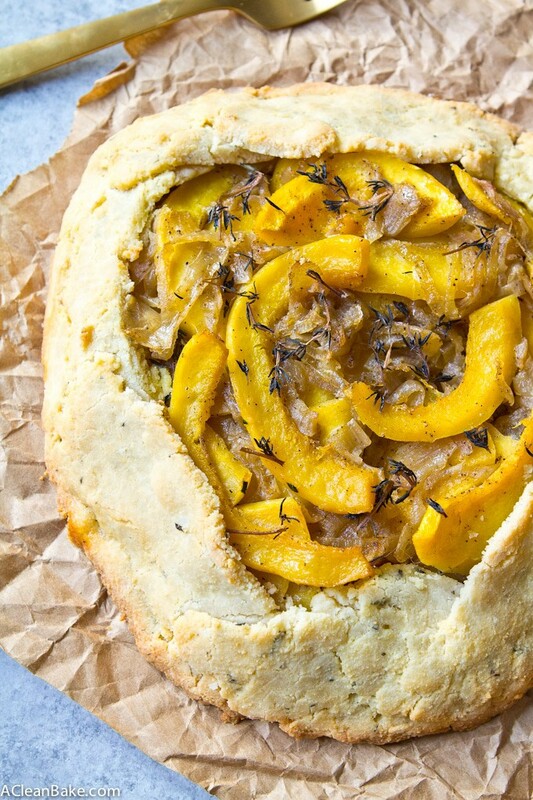 This galette is best within a few hours of baking, but if you have leftovers, store them in an airtight container in the fridge for up to 3 days. Expect the crust to soften and get a little cake-ier with each day in the fridge. First of all, I didn’t know about making caramelized onions in a slow cooker – GAME. CHANGER. And second, this looks so yummy and perfect for next week’s feast! Thanks! I hope you get to try a savory version soon!